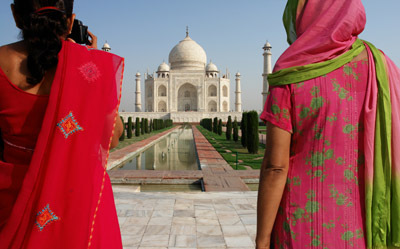 Taj Mahotsav is held annually at Shilpgram in Agra, India, close to where the famed Taj Mahal is located. The festival lasts for 10 days and is held each year from 18 February to 27 February. Entry to the Taj Mahotsav is free for foreigners while the locals have to pay a small entry fee. The festival is organized to revive and celebrate the grandeur of the great Mughal period. The ambience created at the Taj Mahotsav transports you into 18th and 19th century India before she gained independence. The Taj Mahotsav is celebrated with a new theme each year. The theme is selected from the past but has relevance to today’s world. It is usually centered on conveying a universal message. The Taj Mahotsav is a place where artisans from all over India converge and display their fine works. Only the best artisans are invited to showcase their work at this festival. Exquisite handicrafts for which India is famous for can be found in one place. It is a big event and the best textiles, jewelry, pottery, wood carvings and a lot more from different regions of India are up for sale at the festival. Taj Mahotsav has everything that one looks forward to about India. The festival commences with a grand procession in which camels and elephants decorated in regal finery participate. The procession replicates the victory parades from the past with folk dancers and musicians also taking part in traditional costumes. It is a cultural extravaganza with a lot of fanfare. Tourists travel from afar to witness and participate at this event. The sights, sounds and colors of the procession are vibrant, enthralling and captivating. The cultural show continues over the next ten days of the festival with performances scheduled throughout the day. You can also catch performances by international artistes who are specially invited to perform at the event.